Slow economic growth still the main drag for the common currency. EUR/USD to advance within range next week, Fed decision awaited for direction. The EUR/USD pair seesawed between gains and losses throughout the week, finishing it up around the 1.1400 level. For a sixth consecutive week, the pair has been unable to find a certain direction, trapped between a more dovish Fed and slowing growth and political turmoil in the EU. The optimism triggered by speculation about a China-US trade deal sent it up to 1.1418 while fading hopes weren't enough to boost the greenback, which suffered from a mixture of soft employment data, a shrinking yield curve and more dovish comments from Fed officials. Slowing growth in the EU was confirmed this week by the final versions of the Markit PMI, as the Manufacturing index for the whole EU printed to 51.8, up from the initial estimate of 51.6 but down from 52.0 in October, its lowest level since August 2016. Also, the EU final Markit Composite PMI for November reported at 52.7, better than the initial estimate of 52.4, but below October's reading of 53.1, hitting its lowest since September 2016. More worrisome, the official document indicated that it was in Germany where the euro area’s growth slowdown was centered, with the latest data showing the weakest expansion there in nearly four years. In the US, the Nonfarm Payroll report fell short of market's expectations, as the economy added just 155K new jobs in November, although the unemployment rate remained steady at 3.7%, while wages grew by 3.1% YoY, offsetting the poor headline. A shrinking yield curve could be worrisome, but the US is still two steps ahead of the EU, both in monetary policy and economic growth. That said, is only a matter of time the market gets a new balance in the "close to neutral" era. With the year-end around the corner, however, and with Brexit grabbing most of the attention, I would not expect definitions anytime soon. Best chance is with the Fed's next meeting that will take place in a couple of weeks. In the days ahead, the most relevant releases will be US inflation and preliminary Markit estimates of EU growth for December. 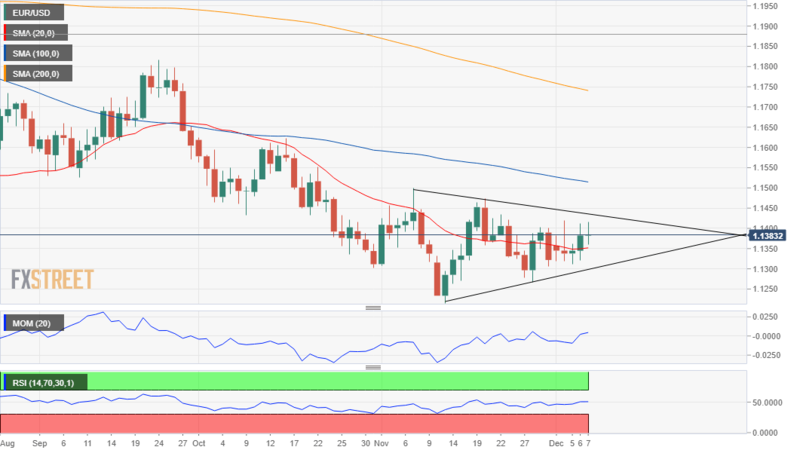 The pair is trading at around 1.1380, that means barely 50 pips higher when compared to the previous Friday's close, trapped within a symmetrical triangle at the end of a bearish movement, usually a sign of consolidation ahead of another directional move in the dominant trend. A break below 1.1250 should be quite discouraging for bulls and open doors for a steeper decline. Technically, the weekly chart shows that the pair keeps holding above a mild bearish 200 SMA, while below the shorter ones, with the 20 SMA extending its decline below the 100 SMA over 200 pips above the current level. Technical indicators in the mentioned chart continue lacking directional strength in negative territory, indicating that bulls remain uninterested. In the daily chart, the pair settled below bearish 100 and 200 DMA and barely above a flat 20 DMA, having seesawed around this last all through the week. The Momentum indicator heads lower below its 100 level while the RSI indicator barely advances around 51, this last, falling short of supporting an upcoming bullish move. Beyond the figure, there are two strong static resistances levels, the first at around 1.1425 and the second at 1.1460 that the pair needs to clear for bulls to consider jumping in firmly and push the pair close to 1.1500. Below the 1.1300 figure, the mentioned 1.1250 level comes in the way of the yearly low at 1.1215. With a break below this last opening doors for a test of the 1.1120/60 price zone. The FXStreet Forecast Poll offers a mixed picture, with bulls dominating the weekly perspective, up to 47% from 39% previously, and with the average target upgraded to 1.1396. Bears are a majority in the monthly perspective but don't seem too confident as the average target increase to 1.1408. For the quarterly perspective, bulls take back over. The Overview chart paints a quite interesting picture. The moving average has turned flat in the weekly and monthly views, with most targets accumulating near the current price. The 3-month view shows a wide spread of possible targets, although most of them accumulate around 1.1500, while the moving average has a modest downward slope, somehow indicating caution ahead of more definitions. Still, there are more chances of a break below 1.10 than of a run beyond 1.20 heading into 2019.